Though his hardships were grotesque, his remembrance of human decency in the unlikeliest of places is infinitely inspiriting. WASHINGTON, D.C., USA, January 15, 2019 /EINPresswire.com/ — The memoir of a Jesuit priest’s journey through the prison camps of Nazi Germany during World War II received glowing praise in its first major literary review. 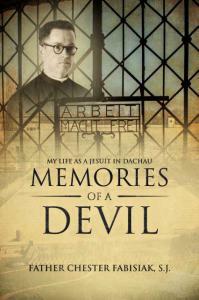 “Memories of a Devil: My Life as a Jesuit Priest in Dachau” is available for sale on Amazon. The Kirkus Reviews review of the book appears in the company’s January magazine. For more information on the book, go to www.memoriesofadevil.com/. The entire Kirkus review can be read at https://www.kirkusreviews.com/book-reviews/chester-fabisiak/memories-of-a-devil/. Next Next post: "Conducting Legal Research in the Age of the Internet" review published by K Todd Wallace, Esq.